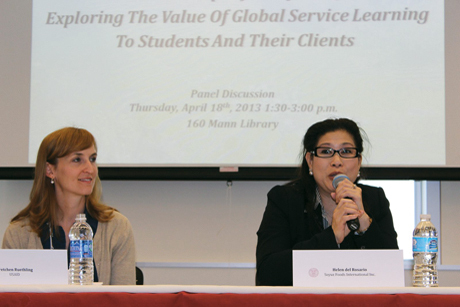 Student teams go global to help businesses « Soyuz Foods International, Inc.
USAID worker Gretchen Ruethling ’10 and Soyuz Foods International owner Helen del Rosario discuss the value of global service learning to their businesses at a SMART symposium, “Relationships of Reciprocity,” April 18. The citrus fruit calamansi looks like a lime, tastes like a lemony mandarin and is believed to have medicinal benefits. But few people outside of the Philippines know about it. A group of Cornell students was challenged to change that.As part of a project within the Student Multidisciplinary Applied Research Teams (SMART) program, eight teams, each with three to five students enrolled in the course Research and Strategy in Emerging Markets, spent two weeks in various countries in Africa and Asia in January for two-week consultations. 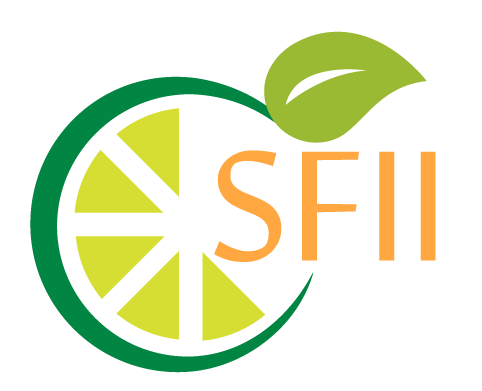 Run by the Cornell International Institute for Food, Agriculture and Development, SMART pairs students with businesses around the world, with the goal of applying classroom knowledge to solve real-life problems identified by the clients. 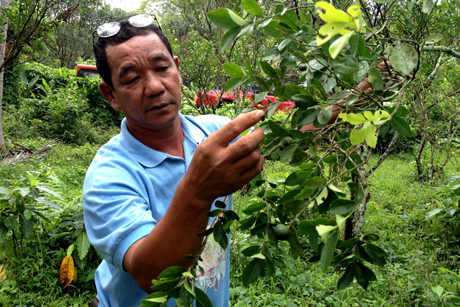 A local calamansi grower explains production of the citrus fruit to students who traveled to the Philippines as part of a SMART program project. Four students, for example, advised the calamansi processing company Soyuz Foods International, which extracts oil from the fruit for pharmaceuticals, cosmetics and cleaning agents, in Manila. They soon discovered that supply was the Soyuz’ biggest challenge. They advised Soyuz to work collectively with seven other businesses in the calamansi “cluster” to bargain with suppliers and market the industry, and they helped make those connections. They also had unprecedented access to high-level government officials and used their outsider status to ask the tough questions that local business owners dared not pose. Grandle said she was startled to learn that processes that might take a few months in the United States can take years to accomplish in the Philippines. Cornell students work alongside students at the University of KwaZulu-Natal and smallholder horticultural producers as part of a South African SMART project. “We take all these international development courses and learn about less efficient government systems and the barriers in the way of industry. But when you are trying to tackle them yourself, you really appreciate just how different it is,” Katie Grandle ’13 said. Del Rosario was speaking as part of an April 18 SMART symposium, “Relationships of Reciprocity.” Clients of other SMART projects also shared their insights into the value of global service learning to their businesses. 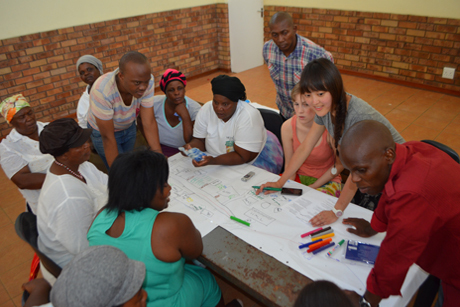 In South Africa, the SMART team worked with students at the University of KwaZulu-Natal to support smallholder horticultural producers. KwaZulu-Natal professor Joyce Chitja said the students helped illuminate a problem – different from the one the farmers initially thought they were facing – and invigorated a community. Although their visit was short, their impact will be long-lasting, she said. Just as important for Chitja was the cross-cultural dialogue the visit created and the confidence it engendered within her own students. Narayan Sundararajan, chief technology officer of the Grameen Intel Social Business, which hosted SMART students in Bangladesh, said he appreciated the fresh outlook the students provided, as well as their knowledge about cutting-edge research, methodology and design, and academic rigor. Gretchen Ruethling ’10, now a desk officer at the U.S. Agency for International Development (USAID), said that her SMART trip to Botswana four years ago was one of the most enriching learning experiences during her time at Cornell. Other teams worked in Uganda, Zambia, Malaysia and Thailand. Stacey Shackford is staff writer for the College of Agriculture and Life Sciences.